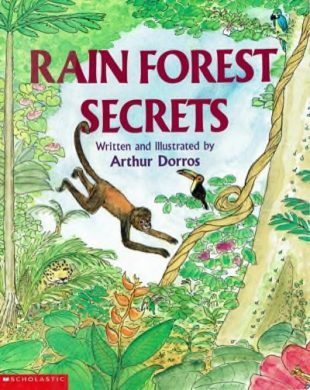 Rain Forest Secrets, Arthur Dorros. NY: Scholastic, 1990. Choose one of the rain forest organizations in the front of the book and write a letter asking for more information, what you can do to help, or something else of interest to you. Choose an animal in the book and do a report about it. Illustrate the report with the animal and make a map showing where the animal is found. Design a poster that promotes the “Save the Rain Forests” campaigns. Write a 30 second commercial spot that goes with your campaign. Record your commercial. Include ideas about how people who live in cities can help. Have a tasting table of foods found in the rain forest. Describe each flavor using a food tasting chart. Foods might include bananas, nuts, and coconut. Chart them with the descriptors sour, sweet, salty, and bitter. Find the map of the world in the book Rain Forest Secrets. Use an atlas to name five countries you can find rain forests in. What U.S. states have rain forests? Make a diorama of a rain forest. Use the book Build it With Boxes on page 34 for some ideas. Also use the book Rain Forest by Ting Morrow for other activities. Read Welcome to the Green House. Find which animals appeared in both books. Write your own story about a rain forest. Maybe you took a trip to one for a day. Make a list of plants or animals found in rain forests. Sort them by what kind of rain forest they would be found in: temperate or tropical. Use a chart (possible group activity). Nature’s Green Umbrella, Gail Gibbons. NY: Morrow Junior Books, 1994. Build it With Boxes, Joan Irvine. NY: Morrow Junior Books, 1994. Welcome to the Green House, Jane Yolen. NY: GP Putnam, 1993. Rainforest Animals, Michael Chinery. NY: Random House, 1992. What’s in the Rainforest?, Suzanne Ross. Los Angeles: Enchanted Rainforest Press, 1991. Rain Forest, Ting Morris. NY: F. Watts, 1994. Where the Forest Meets the Sea, Jeannie Baker. NY: Greenwillow Books, 1987.